I am as sweet as I am stunning! Vanta is the coolest. 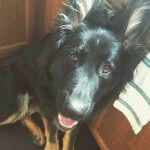 She was born and trained at a kennel in the Czech Republic called Aritar Bastet and came to us at 13 months. She is incredibly intuitive. Vanta is the dog that burglars don’t want to meet after they hop the fence, but is truly the sweetest girl we have at our kennel. She is playful, eager to please and loves to play with the tug. When we got Vanta, we realized it would be easier for us to learn the Czech commands than to try to teach her the German or English ones and she is currently our only dog that we use Czech with. It’s been fun learning commands in a new language. 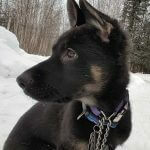 Vanta is another one of our females that loves to play with puppies. Not just her puppies, but anybody’s. She is a guide in behavior to them, but gently reaffirms them and helps keep their confidence up. 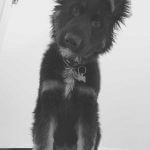 Having Vanta around makes it easy for us to train new puppies… they see her responsiveness to commands and get the gist of reward based training quickly. She drives the boys nuts because she can outrun all of them. Vanta loooooooves to tease and flirt with the boys and watching her evade them as they chase her is unending entertainment. Her flirtatious personality comes off with people, as well. She will be a little coy with the ball with new people to test out their speed. 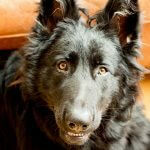 Vanta is an absolutely gorgeous black sable German Shepherd and we enjoy her exuberance for life every single day. 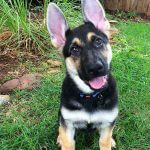 Vanta’s German Shepherd puppies are stunning, just like their mother. 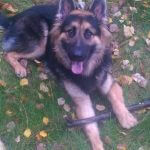 Vanta’s puppies have gone to live with many different types of families. From single people to large families and everything in between. 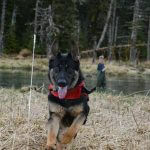 We use temperament testing on every litter to determine whether there is a puppy whose personality and temperament will fit well with a given family or client. Watching her puppies grow up has been a treat for us. They are incredibly intelligent, thoughtful animals, but are also “majestic beasts” as Josh likes to say. 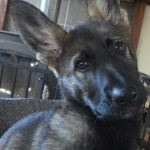 The families that have one of Vanta’s German Shepherd puppies don’t have to worry about someone coming in the front door when they are staring back at them through the window! We are truly lucky to have Vanta as part of our family. You’ll notice that she is the only one of our dogs who (at current) is not named after a color so some of our friends like to call her “Vanta White.” Since we got her after she was already trained, we did not want to change her name. 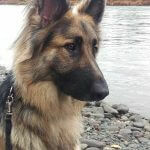 Her name is as distinct among the other dogs as is her beauty as a sable. 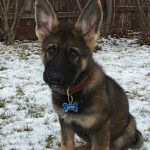 Want A German Shepherd Dog That Will Protect You? Then get ready to train. If you want a dog that is going to actually protect you, you have to train the dog for this. Protection training is serious (though a lot of fun) and should be done in conjunction with someone who knows what they are doing. A dog that is trained in bite work improperly can be incredibly dangerous. 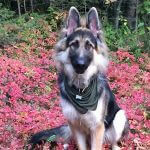 German Shepherd Dogs make fantastic deterrents. The problem with a dog who is highly protective being untrained is that they can misinterpret situations. This is why you see protection trainers teaching their dogs to bark and walk backwards with them while facing the threat head on. 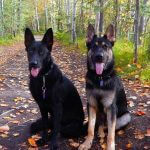 The deterrent of a German Shepherd taught to bark on command and imposing in size and looks is often what most people who think they want a protective dog are actually looking for. 20/20 and other “expose” type shows have done plenty of hidden cams with people who think their dog would attack a burglar. The dogs rarely do. 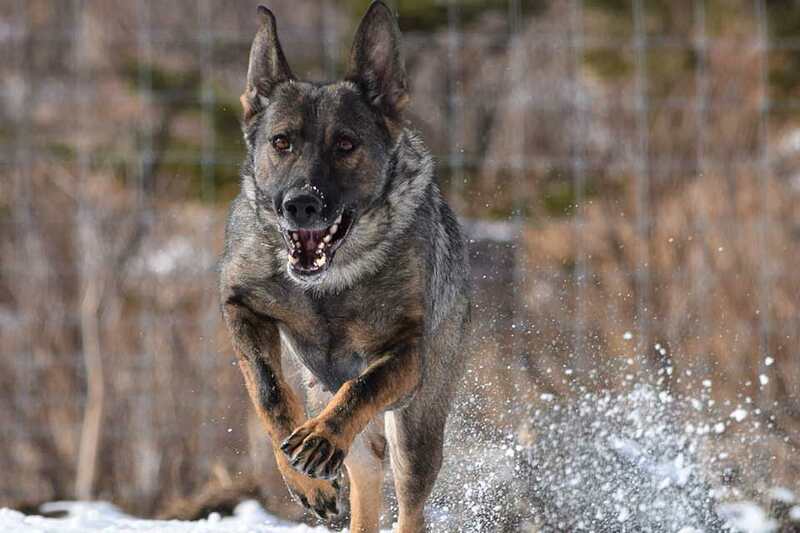 A German Shepherd Dog that stands in the window with a powerful bark will usually prevent the question of whether or not the dog will protect you from a burglar from even coming into play.